North of the Wall, the forces of the Wildlings have been mustering, and the sparse defense provided by the dedicated men of the Nightâ€™s Watch will soon be overwhelmed by this massive army. Take up arms alongside this cause, or against it, and affect the very fate of Westeros! The Wildling Horde is the fourth installment in the Defenders of the North expansion to A Game of Thrones: The Card Game based on George R.R. Martinâ€™s bestselling A Song of Ice and Fire saga. 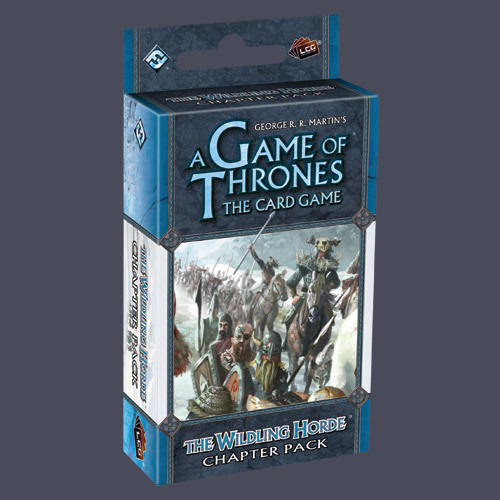 This 60 card pack features 20 different never-before-seen cards designed to augment existing decks and add variety to the A Game of Thrones metagame.